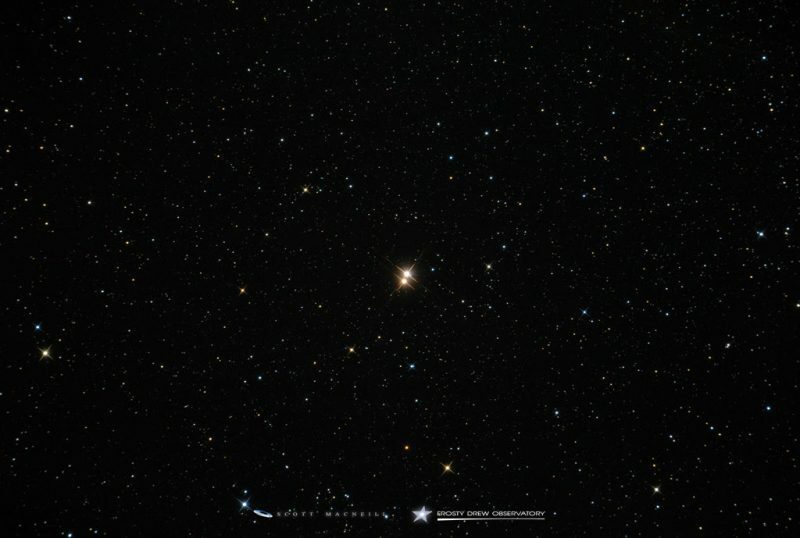 61 Cygni is a double star, captured here by Scott MacNeill at Frosty Drew Observatory, Charlestown, Rhode Island, June 2015. This star, 61 Cygni, isn’t one of the brightest stars. In fact, it takes some effort just to find it, because it is not much brighter than the faintest stars visible to the unaided human eye. It is, however, among the most important of stars visible without optical aid. It has one of the largest proper motions – that is, sideways motions along our line of sight – of any star in our sky. Its large proper motion has given 61 Cygni the nickname Flying Star. 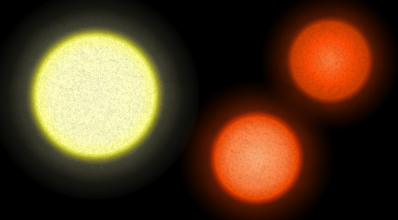 Size comparison of the sun (left), 61 Cygni A (lower) and 61 Cygni B (upper right). Image via RJHall and Wikimedia Commons. Why does 61 Cygni have such a large proper motion? Think about two people who are running, one near you, and the other farther away. In contrast to the more distant landscape, the person closer to you would appear to cover more ground – more objects would pass behind him – than the person farther away. In a way that’s similar, the very distant stars appear “fixed” in relationship to each other. They’re actually all moving through space, but most are so far away that we can’t see them move. 61 Cygni is different. It moves relatively rapidly in front of the fixed stars because 61 Cygni is relatively near Earth. It is one of the closest stars to our sun and Earth. While not the closest star to the sun (that honor goes to the Alpha Centauri system), 61 Cygni is just 11.4 light years distant. 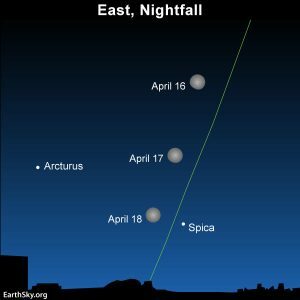 That makes it the fourth-closest star visible to the unaided eye, after Alpha Centauri, Sirius, and Epsilon Eridani. 61 Cygni’s motion across our sky can’t be easily detected with the eye alone over the span of a human lifetime. Astronomers discovered its large proper motion via careful observation. Illustration via University of Oregon. 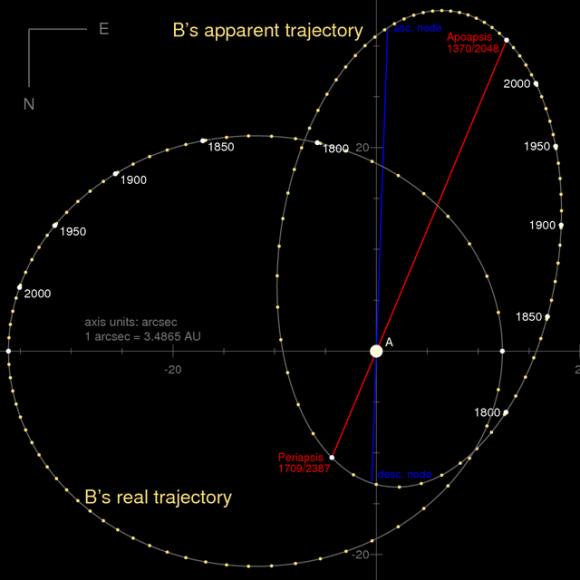 The orbital motion of component B relative to component A as seem from Earth as well as the true appearance from face-on view. The time steps are approximately 10 years. Illustration via Wikimedia Commons. Science of 61 Cygni. 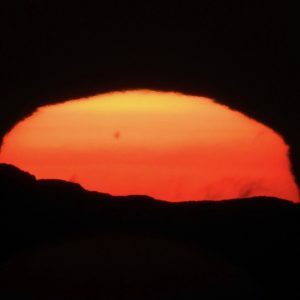 This star is classified as a K2V, which means that it is an orange (K2) “main sequence” (V) star. 61 Cygni isn’t just one star. It’s a binary star, whose double nature cannot be seen with the eye alone. There is a pair of K-type dwarf stars in the single point of light we see as 61 Cygni. They orbit each other with a period of about 659 years. From hottest to coolest, the spectral sequence is OBAFGKM, with the sun being a yellow G type star, compared to the two K-type components of 61 Cygni. Even taken together, the two stars of 61 Cygni cannot match our local star in total energy output. 61 Cygni in history. 61 Cygni boasts no role in classical mythology. Being barely visible to the eye, the ancients apparently left no written reference to it at all. But its role in the history of astronomy is assured. As early as the late 1700s, astronomers recognized that its apparent motion among the stars is far greater than the average. Although this motion would take centuries to notice with the unaided eye, telescopic observations revealed a motion so startling that 61 Cygni earned the nickname the Flying Star. How to see 61 Cygni. 61 Cygni is roughly halfway between two other stars that you can probably identify. The brighter one is Deneb, brightest star in Cygnus the Swan. The other star is Zeta Cygni (otherwise known as Geinah), the end of the Swan’s east wing. You’ll find 61 Cygni between these two. 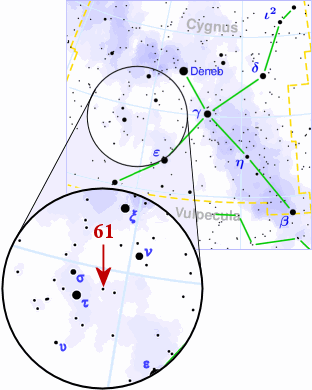 Several other similarly dim stars are located nearby, and an accurate star chart is need to properly identify 61 Cygni. Have fun! Bottom line: 61 Cygni – sometimes called the Flying Star – is not bright. But it moves exceptionally rapidly against the background of more distant stars. Its motion reveals its nearness to Earth.